What are the Important Tools for Xamarin App Development? Celin Smith is tech Geek and developer at Xicom. She loves to learn new things and share the experience. A passionate writer & writes current affair in web technology and shares upcoming trends & news. Why Hire iPhone App Developer for AR and VR Business Apps? What are the Popular Types and Categories of Mobile Apps? What is React Native and How to Animate Header Titles in this? Why cross platform mobile development is in trend right now? Right now Xamarin is one of the most popular framework to develop cross-platform apps. Xamarin development enables you to develop Android, iOS and Windows mobile applications using Visual Studio and C# which makes the app development process much easier. It also allows you to share code between your iOS and Android app and compile it into native code. Xamarin also provides the benefits of native UI, native performance and access to many device features. Xamarin removes the dilemmas many developers face when developing cross-platform apps i.e to separate coding language and UI paradigms. With Xamarin, you can use C# for iOS and Android and Universal Windows apps. With Xamarin forms, interface design for all three platforms can be accomplished within its XAML based framework. Introduction to Xamarin App Development and its various tutorials you can easily read on internet but you will also require some tools to help you get started. That’s why we are giving here the important tools which will be needed in your Xamarin development. Visual Studio has been developed by Microsoft and it is the most modern, comprehensive IDE with so many features for developing mobile, desktop and web applications. It supports the mobile app development with .NET for Android, iOS, tvOS, Mac Desktop apps, .NET Core Applications, ASP.NET Core web application, Cross-platform Unity games and more. Visual Studio includes a rich editor, debugging, native platform integration with iOS, Mac and Android and many other features. In 2017, Visual Studio for Mac has replaced Xamarin Studio and offers all the features of Xamarin Studio and has cloud and web development support and also has many improvements. XCode is wonderful IDE for Xamarin Developer who wants to build an iOS app. Apple’s XCode is the top most IDE for building iOS mobile applications. It is an amazing productive environment for building apps for Mac, iPhone, iPad or Apple Watch and Apple TV. XCode is no doubt a very dynamic IDE which allows the iOS developers to create dynamic and robust iOS apps. XCode is very user friendly and has amazing features. You can develop iOS apps with Xamarin on Visual Studio running on a Windows machine but there must be a Mac computer accessible on the network working as a build host for remote compilation and debugging. Nuget is an important tool developed by Microsoft for modern development platform as it provides a mechanism by which developers can create, share and use useful code. These codes is stored as packages which contain compiled code as DLLs along with other things required in the projects which use these packages. NuGet has a central repository of lakhs of unique packages. These packages are used by millions of .NET developers. Nuget is free and open source. It is favorite for app developer as it offers many benefits. Xamarin Inspector has an interactive C# console with tools for users. The Inspector can integrate with the app debugging workflow of your IDE and can work as a debugging assistant when you will be testing your running app. Prism is a popular framework for building maintainable and testable XAML application. It offers an implementation of a collection of design patterns which are helpful in writing well organized and maintainable XAML applications. Prism core functionality is a shared code based in a Portable Class Library. It is developed by .NET Foundation and is free and open source. InVision is a leading and popular product design collaboration platform. It allows you to upload your design files and add animations and gestures to transform your static screens into clickable and interactive applications. After that you can create context for your projects with boards which are flexible to store, share and talk about design ideas. There are inbuilt layout options to create visual hierarchy for your ideas. Sketch is a vector based design tool for Mac. It has a focus on screen designs and it is used mainly by designers to create websites, icons and user interfaces for mobile and desktop devices. Sketch is useful for both beginners and experts and its powerful and easy to use tools allow the designers to focus on design. NUnit is a popular unit testing framework for all languages supported by .NET platform. Its latest version has been upgraded with many new features and support for all options of .NET platform. xUnit.net is a free, open source and community focused unit testing tool for the .NET Framework. xUnit.net provides the latest technology for unit testing C#, VB.NET, F# and other .NET supported languages. xUnit can work with ReSharper, CodeRush, TestDriven.NET and Xamarin. It is free and open source. The Visual Studio Unit Testing Framework is integrated into some versions of Visual Studio 2005 and later. This unit testing framework is defined in Visual Studio unit testing. Unit testing created with this framework can be executed in Visual Studio or using MSTest.exe from a command line. We have just discussed the important and most popular tools which you can use in the Xamarin development. Most of these tools have strong online communities as most of them are free and open source and supported by .NET platform hence you can join these online communities to learn more about them. One thing is sure that these tools will make your effort of developing cross platform mobile apps using Xamarin on .NET more easy, user friendly and more effective. 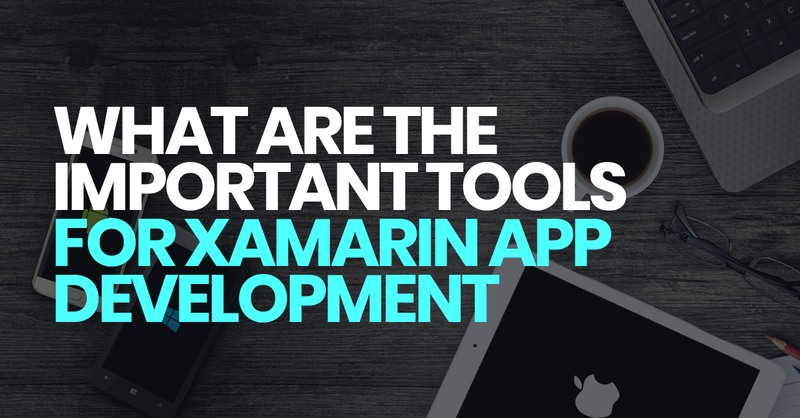 Comments on this post: What are the Important Tools for Xamarin App Development?